Congratulations to our current Transition Year students who earned an A grade in Junior Cert Business! They were awarded certificates by the Business and Accounting Department of Maynooth University for this achievement. The awards ceremony took place in the university in January. Well done to their teachers, too! Ms Fields had the pleasure of attending the UCD Entrance Scholars Awards on Tuesday evening, 13 November. 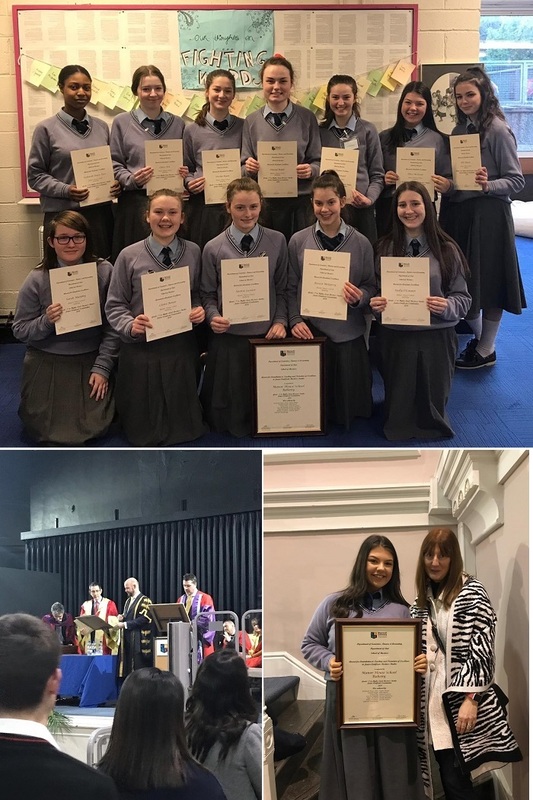 Four students from our graduating class of 2018 were awarded with certificates for achieveing 560 points or more in their Leaving Certificate exam. The O'Reilly Hall was full of Principals, Deputy Principals, parents and extended family of the young people. After the ceremony, they were all invited to refreshments. 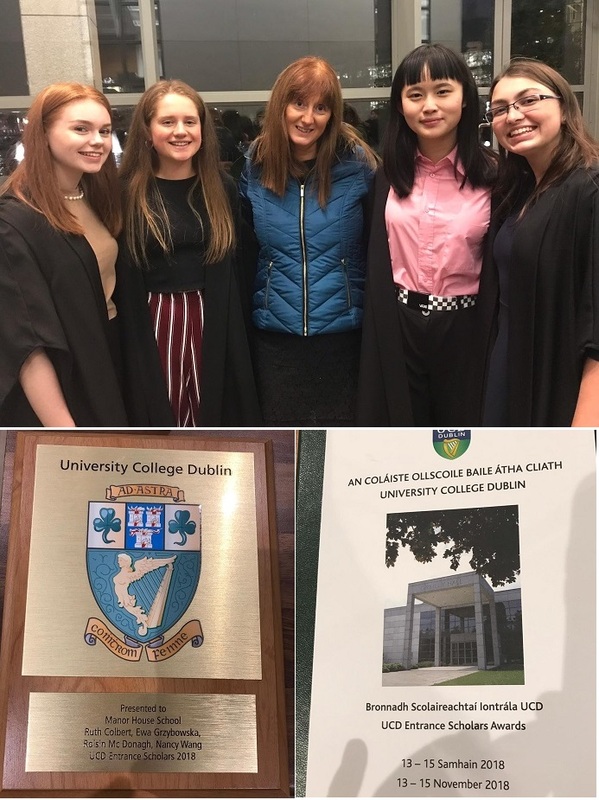 We are very proud of Ruth Colbert (College of Science), Ewa Grzybowska (College of Social Science and Law), Roisin McDonagh (College of Engineering and Architecture) and Nancy Wang (College of Science). An awards ceremony for 1st and 2nd year students took place on 23 May. This was organised by Ms Broderick and Ms Fields. Students' achievements in several categories were acknowledged and applauded. These categories included Music, Art, Sport, Frances Taylor, Kindness, Academic Achievement, Cake-Making and Singing/Dancing. We congratulate the recipients of the awards and are proud of their success. Well done to all! Ms Fields (Year Head for 1st years) and Ms O'Connell (Year Head for 2nd years) were on hand to present the prizes. Have a look at the photos! Nominated by the students themselves. Criterion: 'Someone who has the traits of our foundress i.e. a kind, caring selfless person.' 3 overall winners: Ellie Byrne, Sophia Hijazi and Mia Kirwan. 6 students had perfect attendance: Sinéad Boyle, Sophia Hijazi, Saoirse Lawlor, Crystal Liang, Eva Rogers, Erika Shlionchyk. 100 students were never late and never received a discipline slip throughout their first year. Some achievement! Certificates were given out to members of the Student Council and the Emmanuel choir. Prizes included cinema vouchers, notebooks, pens and plaques made by the Art Department. All class tutors were present at the ceremony as well as Ms O' Neill, Ms Dunwoody and most of the Awards Committee. 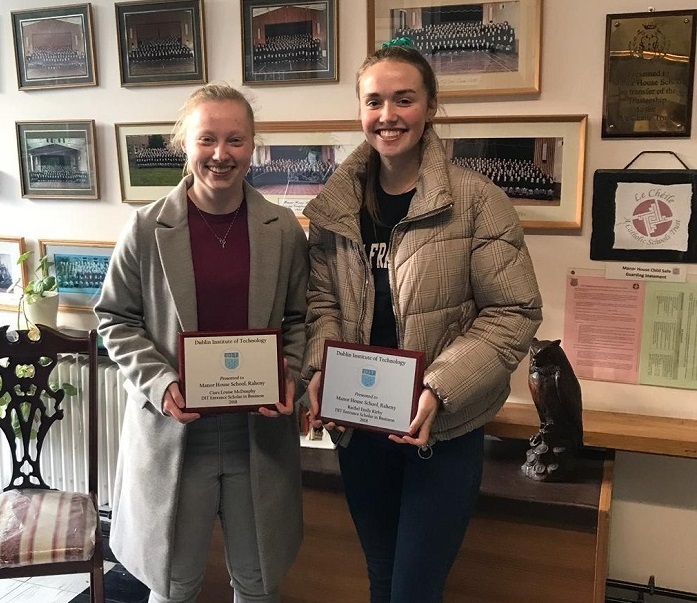 Well done to Ciara McDunphy and Rachel Kirby (Leaving Cert class of 2018) who were awarded Entrance Scholarships to DIT, based on their Leaving Cert results. 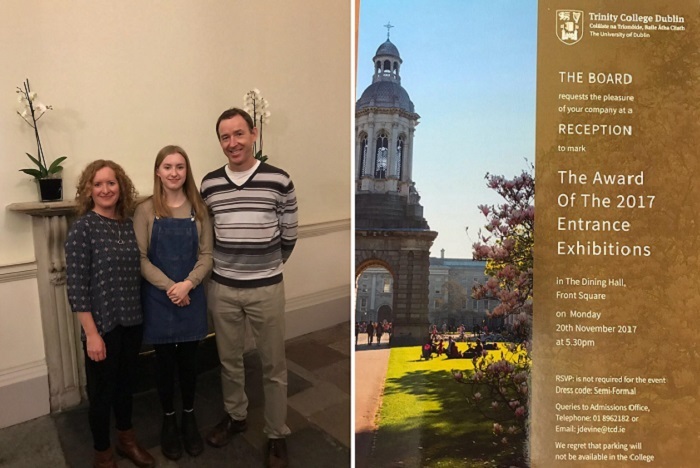 Congratulations to Rachel O' Grady, LC 2017, who was awarded an 'entrance exhibition' from Trinity College Dublin. This award was presented on the basis of her Leaving Cert results. Rachel is pictured here with her proud parents. The Academic Awards presentation took place on Monday 12 December in the Lecture Theatre at 7.30pm. 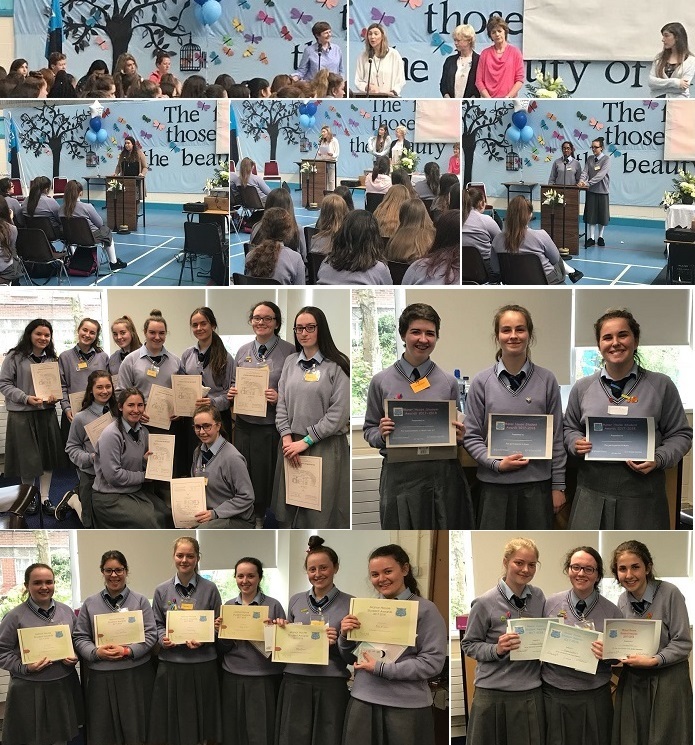 We celebrated the achievements of our wonderful 6th, 5th and 4th year students and some past pupils in the presence of their proud parents and year heads! Ms Brigid McManus, Chairperson of the Board of Management, delivered the main address. Congratulations to Emma Byrne, Rahil Kassouri, Siofra Kelly and April Sheeran (TY) who have been identified as high achievers based on their results in Science and Maths in the Junior Cert exam 2016. Congratulations to a Leaving Cert 2015 Student! Congratulations to Grace Doolan LC Class 2015 who has been awarded an Academic Scholarship to DCU based on her Leaving Certificate results. DCU is inviting Sarah Snee, Ruth Colbert, Amy Sheeran and Rosanna O'Brien to an awards cermony in January 2016. This is to recognise their high achievement in the Junior Cert Business Studies exam. Their parents and teachers, Ms D McGarry and Ms E Farrell are proud of their success.